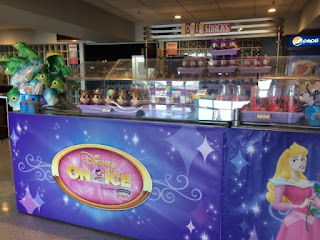 A Dole Whip A Day: Disney On Ice - Super Fun! I got the chance to see Disney On Ice: Dare to Dream last weekend. What a great experience! The show started late because there was a bit of a parking situation (a Raiders/Broncos game sharing the parking lot!) and they wanted to give more people a chance to arrive. While we waited, some other ice skaters came out and did some tricks with little flying discs. 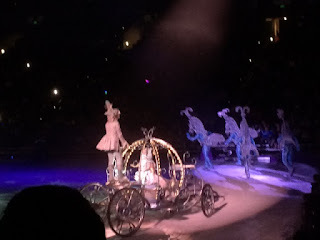 There was also lots of Disney music being played in the background to sing along with. They were already selling all kinds of treats and toys so everyone would be ready! There are plenty of options, if you're looking to buy! 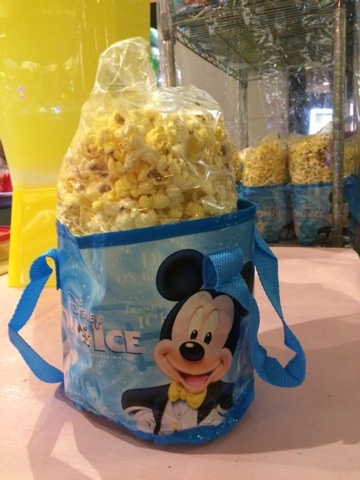 We decided on some of the treats: popcorn in a Disney On Ice bag and cotton candy with a Pascal hat! There are also lights, tshirts, and toys for sale. Pro tip: Lots of families came in Disney clothes and brought toys or food. We bought a pack of glow sticks at Target and brought them with us so we could have the budget for the snacks ($14 cotton candy is a little high!). I've been to Disney On Ice before, so I was used to the setup. Mickey, Minnie, Donald, and Goofy come out in between each segment to (kind of) tie it all together. To start off, there was a little Princess and the Frog intro. It was very upbeat, and I would have loved to have seen a whole segment dedicated to it. Next was Snow White. The magic mirror was a very cool effect as it glided across the ice. My kids have seen the movie before, so they could easily follow the story, but to anyone who hasn't, it probably would have been nice to include the Queen's transformation into the witch. 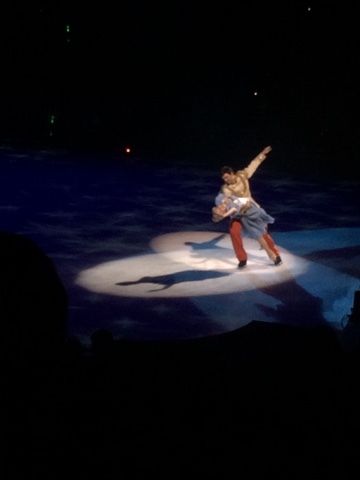 But all of the great music was there and the skating was wonderful. After Snow White was Cinderella. This segment was terrific. It had some very cool costume changes (when the step sisters ruin Cinderella's pink dress and she ends up in rags, and then her transformation into her ball gown after Bibbidi Bobbidi Boo), the Prince has a bigger part than in the movie (hooray! 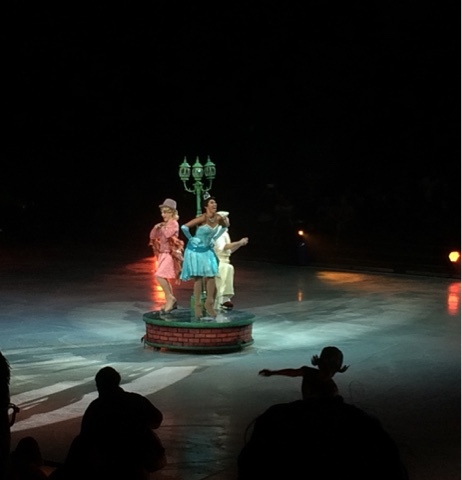 ), and the step sisters were terribly fun! Last was Tangled. 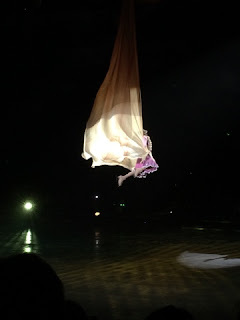 It was pretty amazing! They followed the story very closely, including the frying pan gag and a perfect version of the I Have A Dream song and dance. Maximus the horse made an appearance that was quite impressive! Ice skating horses; who knew, right? 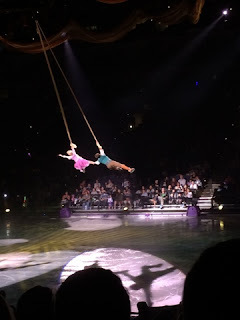 But the best part by far were the aerial tricks that Rapunzel and Flynn did while hanging from her "hair." 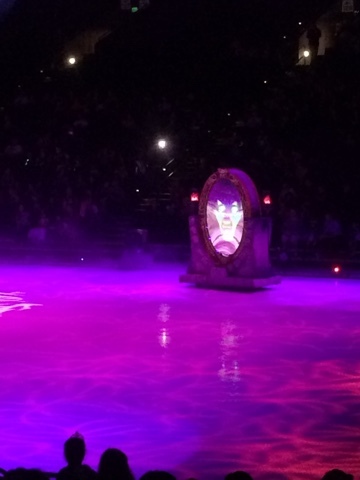 I've never seen anything like it in an ice show! 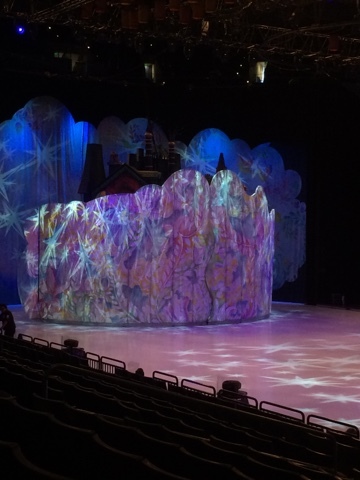 I was going to love it anyway because it's Disney, but really...if you get a chance, go see this show!